2004 Aquasport 225 Explorer, Boat was bought new by me and have spent 2 years setting up vessel to fish. It is in new condition and has 60 hrs on engine. Runs and reads bottom at 50 mph. 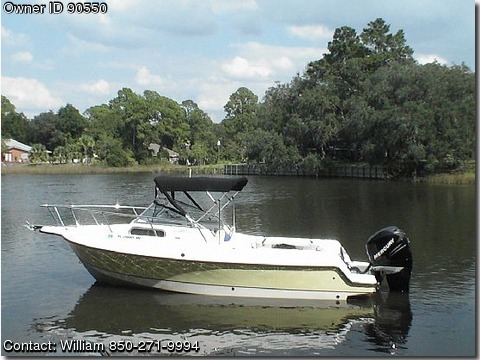 Need to sell because canal to bay has eroded and cannot get out except at medium to high tide. There are a few scratches on lower hull due to this but are superficial or cosmetic. Have about 55K invested in boat but will consider any reasonable offer. $35,000, 850-271-9994 Boat comes with tandem axle magic tilt trailer in good condition. Boat has fresh and salt water washdown. Dive ladder, walk through transom,live well w/pump, large fish box,4 rod holders, new canvas bimini.